It has long been fashionable to accept that, although Duke Ellington has written some great pieces, he proved himself incapable of writing longer works with thematic coherence. In other words, his suites are just collections of separate pieces. On these CDs you will be able to judge the truth of those arguments. The suite made up of six movements was recorded in 1947. Ellington throughout his life acknowledged his debt to Africa. The music was written to mark the 100th anniversary of Liberia's founding by freed American slaves. The accusation that Ellington simply pushed pieces together under one title can be said to have some validity in the Liberian Suite. Ellington never found a great male vocalists but one of the best was Al Hibbler who opens the first movement of the suite. Deep voiced Al is an acquired taste that I have never acquired. Supreme baritone player Harry Carney rescues the piece. Tenorist Al Sears loses his cool on Dance No1. Dance No2 has that most rareinstrument , for Ellington, a vibraphone solo by Tyree Glenn. Dance No3 has Ray Nance on Violin leading up to a thunderous conclusion. Dance 4 has Sonny Greer on tympani. The final dance has Tyre Glenn on trombone this time. Not Ellington's greatest work but the suite does have some fine writing and fine section playing. The Controversial Suite is controversial. It was recorded in 1951 and was subsequently played little. 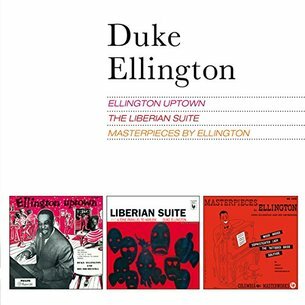 There are various theories about the two movement suite probably the most pervasive is that Ellington was parodying musical trends in white jazz, The first movement, ‘Before My Time’ is dixieland and the second movement ‘Later’ is a view of Kenton type music. Both Dixieland and Kenton were popular in the early fifties while Ellington struggled for acceptance. Worth hearing once but it is not an important part of the Ellington repertoire. Is the 14-minute A Tone Parallel To Harlem (Harlem Suite) jazz? Probably not. It is, however, a good extended composition where Ellington showed that he could integrate melodies and themes. Originally commissioned by Leopold Stokowski it is a portrait of the area in New York where many black musicians lived. The piece was often played, particularly in the sixties and most of the time Ellington would describe what the music was meant to represent with the march section evoking the civil rights demonstrations. This album introduced drummer Louie Bellson who managed to give a band a totally different rhythmic feel. For years Sonny Greer had been the drummer but his style had given the band solid unadventurous rhythms. Bellson brought in his composition ‘Skin Deep’ which began a vogue for drum solos. It is an exciting piece and Bellson plays his extended kit, there are two bass drums, with panache. The version of ‘Take The A Train’ is one of the best versions and includes a long intro from Ellington as well as a vocal from Betty Roche and a solo from Paul Gonsalves, who was beginning an association that would last until 1974. The Perdido arrangement shows that Ellington had imbibed some bop mannerisms and he gives a great deal of space to his trumpet section of Clark Terry, Ray Nance and Cat Anderson. This album was one of the first to take advantage of the longer playing times available on LP. Ellington rearranged Mood Indigo, Sophisticated Lady and Solitude. Initially the LP did not sell well, many thought that they already had versions of these pieces, not really realising that the extra length fundamentally changed the music. It is only recently that these longer arrangements have been re-evaluated. The quality of the recording is very good. You can enjoy the unique sound of Jimmy Hamilton's clarinet, Johnny Hodges' sensuous alto sax, Tyree Glenn's plunger trombone and the walking bass of Wendell Marshall. The recording also captures the beautiful textures of Ellington's writing. What the two CDs give is 157 minutes of music of the Ellington band at a transitional stage of its development. There are also numerous extra live recordings of some of the pieces as well as a 20 page booklet. It is a very generous package and a special insight into one of the music’s greatest figures.